Bicycling Through Classical Greece | ExperiencePlus! When ExperiencePlus! owners Rick and Paola Price asked us to develop the Greece: Athens to Olympia tour we were thrilled! With all the layered history of the Peloponnese and the great biking roads in rural Greece, we knew it would be an excellent tour. And our customers who did our inaugural tour this fall enthusiastically agreed. This tour is thirteen days, a little longer than most ExperiencePlus! tours, but you need those extra days to really appreciate the geography and beauty of this part of Greece. We start the tour on the island of Poros, a quintessential Greek island with traditional, whitewashed houses sweeping up the hillside from the port. From there we take our bikes by ferry across the Aegean to the Pelopennese, the peninsula that extends off southern Greece. Once there, what great biking we enjoy! Most of our customers this past fall were seasoned ExPlus-ers, and they were amazed at the variety of terrain in this region. We have rides right along the ocean, where you can take advantage of excellent beaches for swimming. We have challenging hills, although even 11 year old Pete Z. from Wisconsin this past fall didn’t get off his bike! We spend a day winding through the famous Nemea wine region of Greece and get to sample the local varieties the same night. And we enjoy the beautiful valleys of Greece’s agricultural heartland. Another of the great things about this tour is the opportunity it offers to engage with the locals. Except for children, it is rare to see the Greeks out on bicycles, so we attract a lot of attention going through the small villages. During the harvest season, we have been given more grapes than we can carry on our bikes and invited to watch the raisin curing process at a private house. One of our customers last year, Marty C., had 12 kids on bikes waiting for her at the top of a long climb. Then they personally escorted her through their villiage, shouting her name the whole way! Of course, gourmet food is abundant on the trip. 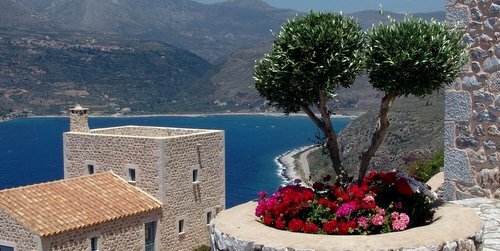 Greek villages are famous for their tavernas and we offer suggestions every day on our favorite places to find delicious meals and fresh local produce. And, after a good day on the bike, there is nothing better than sitting down to a multi-course dinner with the group, drinking the local wine, and relating the adventures of the day. But in the end, our customers from this past year felt that the best part of the trip was the history of Greece and the areas through which we pedal. Where else could you see where Heinrich Schliemann dug up the mask of Agamemnon? Visit the theatre at Epidauros – one of the best preserved ancient theatres in the world? Walk in the fortress at Nafplio – the first capital of Greece? And finally bike into Ancient Olympia – where the flame is still lit and carried all over the world for each Olympics? And all in 13 days! Come and visit us. We would like to show it all to you!